L-R: High Waist HotPants Capri, Zaggora; Nike Lady Zoom Vomero+ 8 Running Shoes*, SportsShoes; Shock Absorber Active Multi Sports Support Bra, Figleaves. Yep, it’s that time of year, again; the festive season is well and truly over (boo! ), and gyms everywhere are overrun with New Years’ Resolutioners, intent on meeting their health/fitness/weight loss/gain goals for 2014. Personally, I decided to ditch my gym membership, this year, and have been opting for a combination of at-home and outdoor workouts instead (but more on that in an upcoming post), which can make motivating myself pretty difficult. Whilst working out at home does mean that I don’t have to worry about my completely unglamourous combination of a messy bun and bright red face, I do find that the one thing that really gets me going is a good workout kit…and, after what feels like years of searching, I’ve finally found the perfect balance of fashionable and functional. Now all I have to do is throw on my kit, a coat of mascara (yes, I am one of those people – no foundation, though! ), and get running. 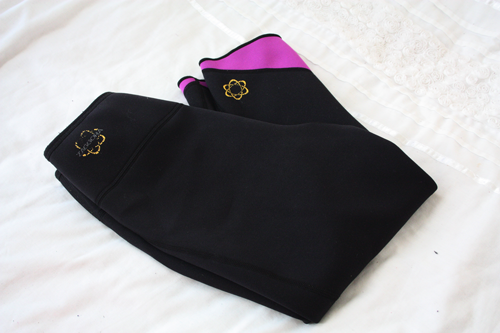 Zaggora HotPants were on my fitness wishlist for ages; for anyone not familiar with the brand, their ‘ThermoFit Technology’ means the fabric of all their leggings, shorts, and tees generate more heat than regular gym clothes, and encourage your body to burn more calories as you work out. I have been using the Zaggora HotPants for about 30 minutes to an hour per day for the past few months, and have definitely noticed an improvement in my skin tone and the inches I’ve lost from my legs, which have always been a problem area of mine, and you can really feel your legs heating up a lot more than usual when going through your workout. I’ve never been someone who invests much in trainers, usually preferring to get a cheap pair from Sports Direct than spending any real money on something I only wear to get hot and sweaty in, but, after suffering some pretty painful consequences of my scrimping and saving following my half-marathon for Cancer Research, I soon realised how ridiculous this had been of me. Trainers are, ideally, the one part of your workout kit you should invest in, and the right pair can completely enhance your performance. Since I’ve started wearing these Nike Lady Zoom Vomero+ 8 Running Shoes*, I’ve been able to push myself much further; they’re incredibly well-cushioned, and the open-mesh upper means you don’t have to worry about getting overheated. 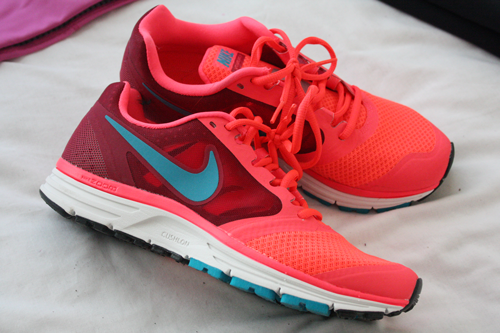 This particular style will set you back about £100 on the Nike website, but my exact pair are £69.99 from SportsShoes. If you’re a runner, walker, or a gym bunny, I’d seriously suggest investing in a pair – they’re the best part of my gym kit. 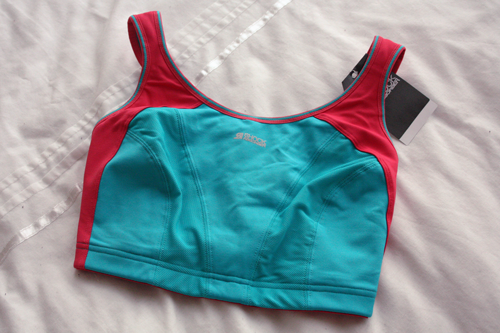 As all my fellow DD+ girls know, finding a good high impact sports bra at an affordable price can be a bit of a nightmare; whilst this Shock Absorber one set me back £26 in the Figleaves sale – they are the only brand I’ve found that offer the kind of support necessary for my small back and larger cup size, and I can’t recommend the brand enough for anyone who needs an increased level of support when they work out. Shock Absorber bras are also made from ultra-breathable fabrics, so you don’t get uncomfortable if you’re wearing layers. They also offer a pretty impressive range of colours, so, if, like me, you’re into looking colourful whilst you get your glow on, then it’s an ideal range for you. What are your favourite brands to workout in? Do you have any health & fitness based resolutions?